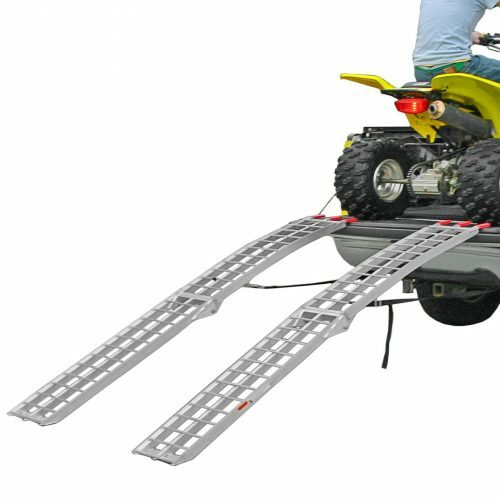 Those who love outdoor sports with off-road vehicles know that owning ATV ramps is crucial. There is need to get the vehicle to the place of the event. How do you get it into your truck or pick up? The possibility of lifting it up may not be a choice. You can quickly do that using ATV ramps. They will help you drive up through them and put your dirt bike on the flatbed. There are various types of the make. Do you want the best choices? If the answer is a yes, take a look at the top 10 best ATV ramps in 2019. These ATV Ramos have entered the market recently, and they are taking it by a storm. Therefore, if you have some lift to do, this one should be an ideal choice. It can load a lot of things including ATV as well as a lawnmower among others. Its arched design plays a prominent role in ensuring that you load your items quickly. In addition to that, clearance becomes a walk in the park. When it comes to storage, its foldable design makes it simple. The construction material is Aluminum which makes it durable. If that is the case, isn’t it worth buying? Once you fold it, it measures 45.3 x 12 inches. Pit Posse is also doing an excellent job in ensuring that ATV ramps seekers get a great product. Therefore, you can rely on them for loading equipment. What does it offer? Read on! It has a lightweight design which makes portability possible. Additionally, it is foldable so that it can also be easy to store. Due to the tie-down strap, you are safe and hence work confidently. For the material, it is a brilliant one. It is none other than aluminum. No tailgate damage all thanks to the E-Z grip rubber truck rest. 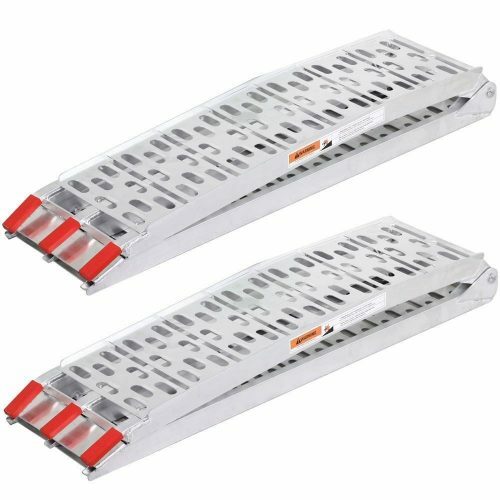 It carries 600 lbs per ramp hen a total of 1200 for the pair. Its weight is 34 pounds. 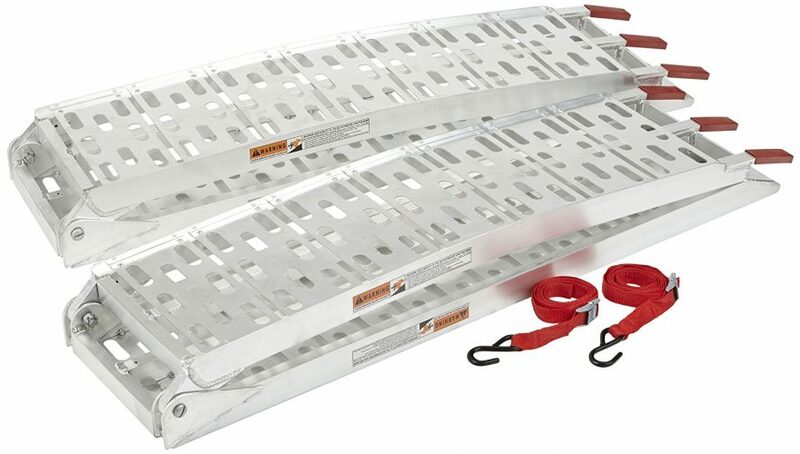 Up next are ATV ramps from MotoAlliance. Its wide range of use is incredible. It can do well with utility & golf cart, garden tractor, dirt bike, trailers, motorcycle, pickup, truck, lawnmower as well as ATV & UTV. There is more about it below. Its design is that of solid plate kit. It is also lightweight for easy portability. In addition to that, it has an arched design for simple clearance. Due to the sturdy construction, with material like aluminum, its longevity is indisputable. Its rubber tipped fingers make it safe for use. It comes ready for work thus no assembly. The maximum capacity is 1500 lbs for the pair. Its weight is 32 lbs. Extended and folded dimensions are 89 x 12 inches and 45.25 x 12 inches, respectively. With formidable brands like Titan Ramps, it goes without a say that the items you get are worth. 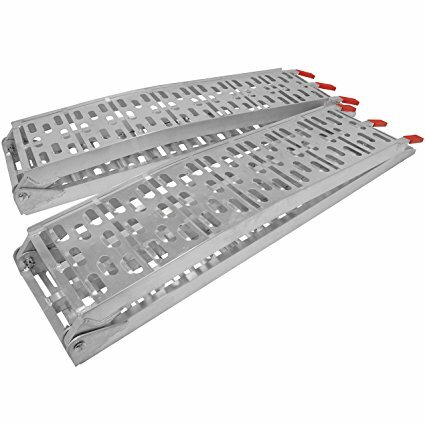 That is why its ATV ramps are among the best in the market. Therefore, do not hesitate to buy it for the loading of your four-wheeled items into a trailer or truck. Its design is not only lightweight but also foldable. Therefore, you reap benefits such as easy portability and storage. Due to simple clearance, it also has an arched design. Thanks to the aluminum material, what you buy lasts for long. Each pair has a capacity of 1500 lbs. Thanks to the serrated crossbars, the traction is impressive. The folded and extended dimensions are 45.5 x 11 x 55 inches and 90 x 11 inches, respectively. 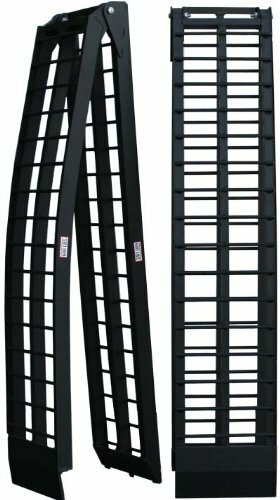 The black window is no exception either when it comes to high-quality ATV ramps. When transporting your off-road vehicles into a trailer or the pickup, this is an ideal tool for work. It is one of the few that are for use with big wheeled items. Its foldable design is one of its many advantages. Therefore, you get to fold it into a compact size that is easy to store. When it comes to construction, it is better than the rest by a landslide. Why not when its material is 1-inch steel tubing? In addition to that, it has a durable black finish. How then would it not offer its services for long? Its maximum capacity is 1,000 lbs. It has a mechanism of filtering debris. Its weight is 48 pounds. It is ideal for large wheeled vehicles. 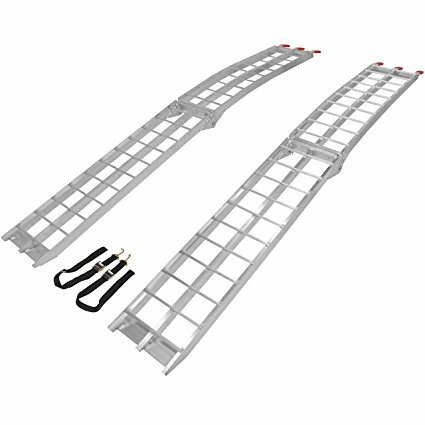 Among the many products that Motorhot supplies online, there are the ATV ramps. With its globally impressive reputation, anyone expecting something short of expectation would be in for a rude shock. What is it all about? The product has a bi-folding design. As a result, it becomes easy to store and very comfortable to move it around. It is also a high-quality item. What do you expect when the material of construction is aluminum? It would be a significant loss of opportunity if you did not consider it before making a choice. The foldable and extended dimensions are 46 x 11 inches and 90 x 11 x 5 inches, respectively. Its weight is 37 lbs. The maximum carrying capacity is 1500 lbs for the pair. It saves a lot of storage space. The fact that this one is also from Titan Ramps speaks volume. Do you own an ATV, lawnmower or any other four-wheeled off-road vehicle? If your answer is a resounding yes, I have good news. Purchase this product and get an easy time loading it into a trailer or truck. What more would you want, my friend? When it comes to its design, it is lightweight hence easy to transport it. On the other hand, its plate top ensures that spillage is out of the picture. In addition to that, it has an arched design which makes clearance a breeze. The material is aluminum which plays a significant role when it comes to durability. Its weight is 33 lbs. The maximum carrying capacity is 1,500 lbs. 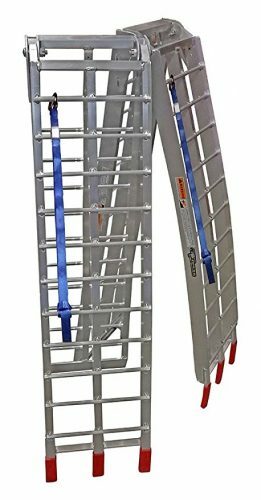 It is safe for use thanks to the rubber tipped fingers as well as safety straps. Folded and extended dimensions are 45.5 x 11 x 6 inches and 90 x 11 inches, respectively. Black Widow, again! 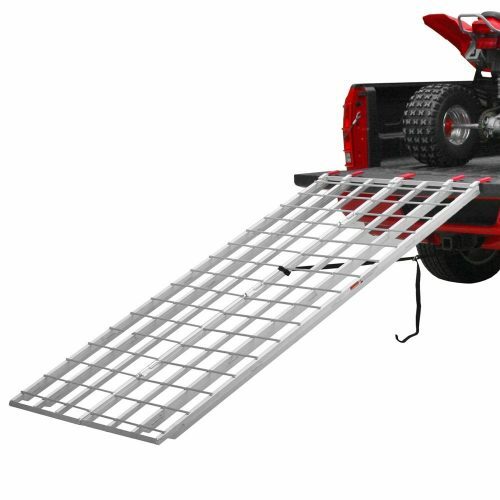 That shows the high quality that the brand offers when it comes to ATV ramps. There are many reasons as to why you should consider buying it. May it be the features or design, this is a remarkable choice. The details unveil in a moment. Its design allows it to be ideal for many four-wheeled off-road vehicles. The only exception is the Golf carts. Its arched design allows maximum clearance. It has a lightweight and compact design as well. In addition to that it is foldable hence saves storage space. Its sturdy aluminum construction makes durability a guarantee. It has a maximum carrying capacity of 1,500 lbs. It has adjustable straps as we as rubber tipped fingers for security while handling it. There is maximum traction because of the serrated rungs grip. Its weight is 29 pounds. The Black Window ATV ramps appear for the third time now. Doesn’t that show how buying one of them could be a smart choice? Support, safety, and durability become achievable because of its other aspects such as design and features. Therefore, you should go for it. Its design is both durable and foldable. Therefore, you have an easy time storing it and get the value for your money. Isn’t that what everyone wants? Other than that, the material is aluminum. Other than being long-lasting, it is also rust-resistant. Its maximum carrying capacity is 1,500 lbs. You should expect great traction because of the serrated rungs. The sturdy hinges make foldability possible. For the sake of the safety of your truck, there are rubber-coated fingers. The weight is 41 pounds. Dimensions are 95 x 50 x 2 inches. The crème Del crème of our list of the best ATV cramps is one from Titan Ramps. Again? Yes because they offer what anyone looking for such a product would want. It would be a great investment to buy this product. What makes it a great choice? Keep reading. It has a design that is lightweight as well as foldable. For that reason, portability is a breeze. In addition to that, storage is convenient. When it comes to the clearance, it can’t get any better. The reason is that it also has an arched design. The construction material is aluminum hence lasts for an extended period. The weight is 45 lbs. Its maximum carrying capacity is 1,200 lbs. The foldable and extended dimensions are 60 x 11.25 x 6 inched and 120 x 11 x 6 inches, respectively. 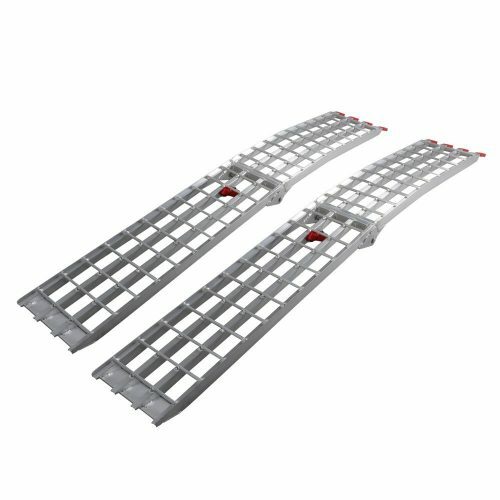 There is an excellent traction thanks to the serrated crossbars. There is need to assemble it since the manufacturer takes care of that. It has safety straps as well. 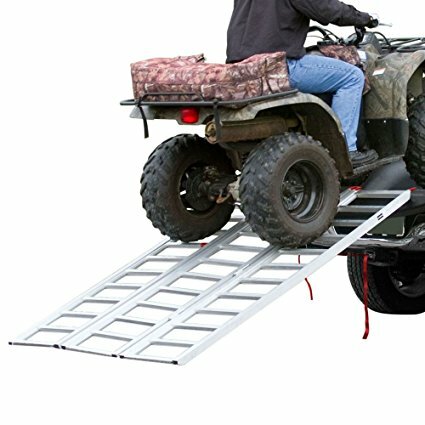 These ATV ramps are the best for the job. They will ensure that loading your small four-wheeled vehicles is effortless. Do you want a one-piece or two-piece design? The first one folds twice while the other one comes in a pair. As much as the former is ideal for three-wheeled carts, it will not do well with the wide ones. When it comes to the other design, the vice versa is true. Before settling for one of the products above, be keen on the size as well as capacity. That should assist you to narrow down your choices. Grab one of them for excellent service.